Not to be confused with Nunthorpe Grammar School. Nunthorpe is an outer suburb of the town of Middlesbrough, England. Historically part of the North Riding of Yorkshire, Nunthorpe is served by Nunthorpe and Gypsy Lane railway stations, both of which are on the Esk Valley Line from Middlesbrough to Whitby. The railway line here forms the boundary between the boroughs of Middlesbrough and Redcar and Cleveland, both of which are unitary authorities and are associated with the county of North Yorkshire for ceremonial purposes. Nunthorpe civil parish is west of the railway line, in Middlesbrough, whilst the area east of the railway line forms part of the Ormesby ward of Redcar and Cleveland. The history of Nunthorpe can be traced back to before the Domesday Book of 1086. The village was named “Thorpe”, or “Torp” (words meaning settlement) in the Domesday Book and described as a thriving settlement, Nunthorpe consisted of an estimated 1,080 acres of land. Towards the end of the 12th century a group of Cistercians nuns, allegedly evicted from nearby Hutton Lowcross for rowdy behaviour, were resettled at Thorpe having been given some land there belonging to Whitby Abbey, on which they built a priory and mill. The nuns only stayed at Thorpe a few years, but their short stay resulted in Thorpe being renamed Nunthorpe. During the following centuries, Nunthorpe remained an agricultural community closely linked to the market towns of Stokesley and Ayton. The Industrial Revolution had very little impact on its agricultural economy. Nunthorpe Hall in the old village. Nunthorpe Hall is the ancient manor house in Nunthorpe village. It was built in 1623, and largely rebuilt and extended in around 1800 and altered again in the mid-1800s. The entrance porch and was added in 1901. The building was converted into a retirement home for the elderly in 1951. The main building is of dressed sandstone, with Lakeland slate roofs, with stone ridge copings. It became a Grade II, listed building, in 1952. The census of 1811 shows Nunthorpe to have had a population of 128, living either in the village of Nunthorpe or on nearby farms. 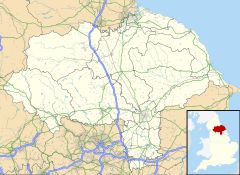 Nunthorpe was at that time registered as being in the North Riding of York, in the Parish of Great Ayton. Its economy was all related to agriculture and farming. The rapid growth of Middlesbrough from a population of 35, in 1811, to a population of 91,302, in 1901 appeared to have had little effect on Nunthorpe, which kept its agricultural throughout the 19th century. Nunthorpe's population in comparison only reaching 198 persons by 1901. In 1853, Middlesbrough to Guisborough Railway line opened, with a station at Nunthorpe and passenger services the following year. Several important Middlesbrough industrialists chose Nunthorpe as their home and contributed to the development of the village. These men included Isaac Wilson, ironmaster, Mayor of Middlesbrough and later Liberal MP, John Swan, ironmaster, William Hopkins, ironmaster and mayor of Middlesbrough and Sir Arthur Dorman, ironmaster. The settlement that is known as Nunthorpe today is that which grew up around the railway station. Nunthorpe village is situated about 1 mile (1.6 km) to the south of the main suburban area. In the early 20th Century, Sir Arthur Dorman planned and built a new small suburb around the railway station for his workers He imposed several covenants on the building: - shops were not permitted, public houses were also not allowed, the houses had to have slate roofs and were not permitted to have house numbers. The layout included tree-lined roads, with spacious houses, each with a garden built in terraces. The houses were certainly an improvement on the small workers’ houses built in Middlesbrough. By 1912, about 60 houses had been built around the station area of Nunthorpe. New housing estates, schools and churches were built during the late 1950s, 1960s and 1970s.. The historical development of Nunthorpe initially started with the building of generously sized houses in generous gardens. This has given Nunthorpe its continued heritage with an open and spacious character. Grey Towers: built in 1865 by Middlesbrough ironmaster, William Randolph Innis Hopkins. Grey Towers House is a large house, built in 1865 for William Hopkins, Mayor of Middlesbrough. It has an unusual aspect in that it is faced with whinstone, compared to the traditional sandstone of the area. Arthur Dorman, of the steel makers Dorman Long, lived there until his death in 1931. Alderman Sir Thomas Gibson Poole bought the estate and presented it to Middlesbrough Council as a tuberculosis sanatorium, known first as Poole Sanatorium, and later as Poole Hospital. It was opened as a hospital, first in 1932, and expanded with further buildings, in 1945. It closed as a hospital in 1988. In 1988, it also became a Grade II listed building. Nunthorpe is served by four primary schools; Chandlers Ridge Academy, The Avenue, Nunthorpe and St Bernadette's Catholic School. Situated next to Nunthorpe Primary School is Nunthorpe Academy, a Specialist Science, Business and Enterprise Academy (since 2012). It operated as a selective County Modern school prior to 1973 and then as a comprehensive school. Since September 2008, there has been a Sixth Form College located next to the secondary school, in collaboration with a campus in Teesville. Nunthorpe is served by both Gypsy Lane and Nunthorpe railway stations, which are on the Middlesbrough to Whitby, Esk Valley Line. Nunthorpe has good bus connections to Middlesbrough and Guisborough. It is located close to main roads like the A174 and A19. Nunthorpe has a football club, complete with squash and tennis courts; there is also a cricket club. The Cleveland Hills can be seen as the backdrop to this local amenity, with Roseberry Topping clearly visible. A parade of local shops can be found on Guisborough Road including a florist, pharmacy and post office with local newsagent Rookwood News found on nearby Rookwood Road. An amateur drama group, The Nunthorpe Players, founded in 1962, regularly performs at St. Mary's Church Hall in Nunthorpe. Graeme Murty – footballer who went to school in Nunthorpe. Kirsten O'Brien – media presenter. Liam Plunkett – cricketer who went to school in Nunthorpe. Chris Tomlinson – long jumper. Amelia Lily - singer (X Factor 2011 finalist) and Celebrity Big Brother 20 housemate. Chris Liddle – cricketer who went to school in Nunthorpe. ^ "Civil Parish & Middlesbrough Ward 2011". Neighbourhood Statistics. Office for National Statistics. Retrieved 22 July 2015. ^ "British Listed Buildings website - Nunthorpe Hall, Nunthorpe". Retrieved 15 May 2014. ^ "Timeline 19th and 20th century". Nunthorpe History Group. Retrieved 10 July 2015. ^ "Grey Towers House (Poole Hospital) and Attached Wall - Nunthorpe". British Listed Buildings. Retrieved 10 July 2015. ^ "Right royal Boro boy". gazettelive. 16 August 2006. Retrieved 11 January 2017. ^ Ford, Coreena (8 October 2011). "Baby joy for Middlesbrough star Kirsten O'Brien". nechronicle. Retrieved 11 January 2017. ^ "Plunkett joy marred by Pattison injury". The Northern Echo. 2 June 2003. Retrieved 11 January 2017. ^ Eaves, Krysta (13 September 2011). "Teesside long jumper Chris Tomlinson stars in car ad". gazettelive. Retrieved 11 January 2017. ^ Chaudhary, Vivek (14 December 2001). "Precocious footballer with a love of the nightlife". The Guardian. Retrieved 11 January 2017. ^ "Peter Gilmore obituary; actor best known for his role as the rugged and handsome captain in The Onedin Line". The Guardian. Retrieved 16 February 2013. ^ Westcott, Matt (12 November 2011). "North-East star Amelia Lily voted back onto X-Factor". The Northern Echo. Retrieved 11 January 2017. ^ Fraser, Paul (12 May 2016). "Ben Gibson's Premier League dreams with Boro become reality". The Northern Echo. Retrieved 11 January 2017. ^ "Chris Liddle". Cricinfo. Retrieved 11 January 2017. Wikimedia Commons has media related to Nunthorpe.